The Vidonn X5 is packaged in a smart attractive clear box – and is minimal in doing away with the need of any usb cables or charging cradles. No cradlegate like the Samsung Galaxy Gear Live then with the tons of complaints on the poor quality of the charger. Also, for those who are not familiar with Chinese, at least the Vidonn X5 come with an English instruction booklet, but using the bracelet is actually pretty straight forward. The bracelet itself is light – at only 20g, which is important as you would be leaving the bracelet on almost all the time. 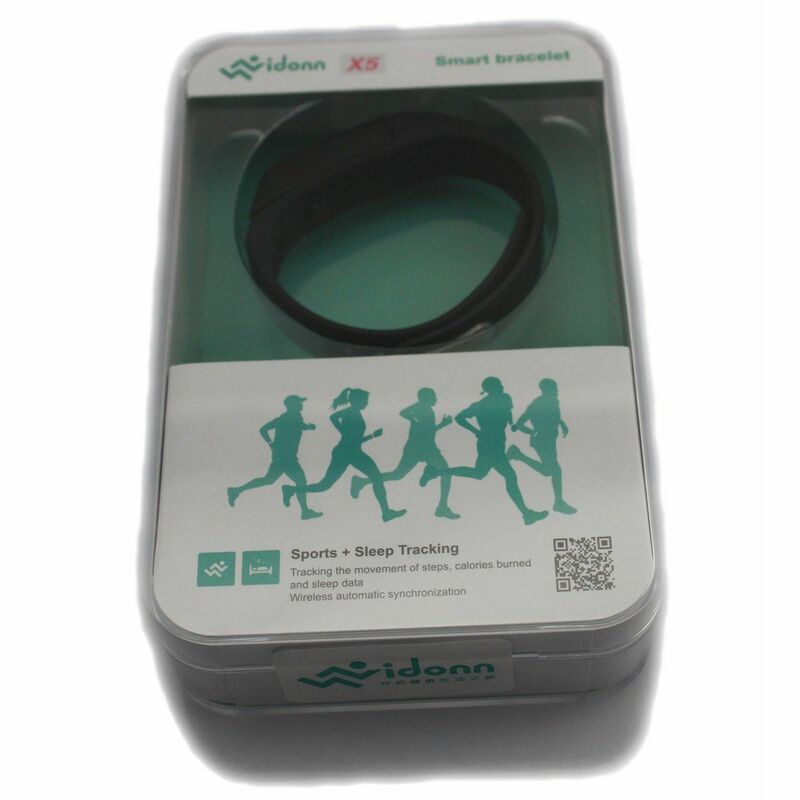 The bracelet band is made of soft rubber which is non-irritating and comfortable to wear. It is also certified IP67 – which means it can sustain certain waterproof conditions. It allows you to wear the bracelet in in rain or shine, all day long and even in a shower. However, prolonged swimming is probably not a good idea. Quite amazing considering it actually has 0.49″ OLED display and a multifunction button, all securely sealed inside of the main removable unit. Bracelet itself has a double pin clasp which helps it keep securely around your wrist. The actual activity tracker has a full USB port connector and looks somewhat like a thumbdrive. It is connected snugly to the bracelet by a pair of pins and the USB port would be surrounded by the rubber band. Plug the activity tracker into your laptop or smartphone charger to charge it. The OLD display will indicate the charging status and typically, would require 2-3 hours for a full charge. Battery life is slated to last 4 days – and this is achieved by the mini OLED display, and generally, the clock stays off until you press the main button. Pressing once displays the time and a battery status. Second press shows you a number of steps, and a third press shows the calories burned. It basically reports the stats accumulated on a daily basis. If you wish to track a particular activity, you can press and hold the main button for 3 sec for the phone to then log the stats for a specific period. Press and hold again to revert. You can use the Vidonn tracker as a standalone but the main interest should be in combining it with the app – available on both Android Google Play and Apple iOS store. The official app is once again in English and pretty easy to setup. However, do note that Android 4.3 is required. It supports Bluetooth 4.0 so battery consumption is minimised. Apple users should not need to worry as long as you are using an iPhone 4S and newer. 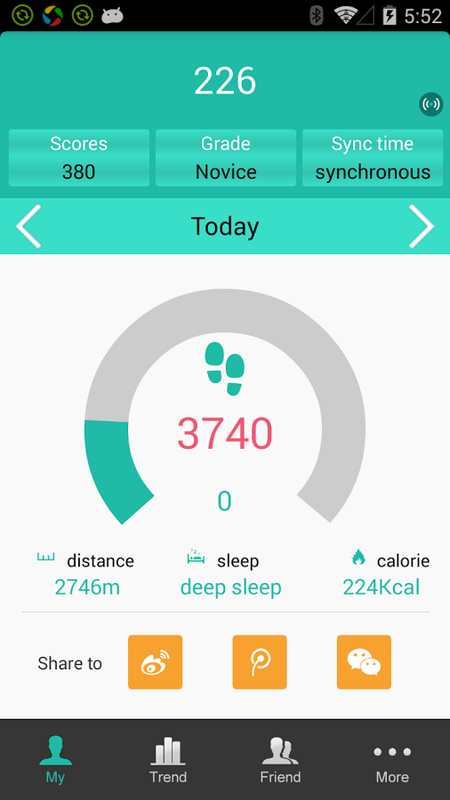 When you launch the app, you would see the the number of steps and calories burned as well as the battery status. On top of that, you would also see the overall distance and a sleep monitor. I am not sure how the sleep monitor works though. You would first need to enter your typical sleep time period – and I am assuming it tracks the movement to report the toss and turn activity and convert it to the sleep cycles. The app can also be configured as a basic reminder, perhaps for medication or other recurring activities with up to 8 different alarm clocks. Due to the fact that it is bluetooth 4.0 compatible, there is a third party app to offer more functionality – called OpenVidonn. It is also a positive sign on the popularity of the device. OpenVidonn is an alternative to Vidonn’s own Android app, that enables one to read the data stored in the Vidonn X5 sports tracker. The app is basic but bodes well that other developers can do something similar to make sense of the data and incorporate more functionalities to the tracker. Perhaps, a notification system alert for your phone. The Vidonn X5 is available from Gearbest – at US$38.77. Use promotion code ILOVEGB for an additional 8% off to bring the price to US$35.66. Available in multiple colours. Gearbest is one of the newer suppliers on the scene, similar to DealExtreme – but I like them because they use Paypal, have pretty great promotions on interesting gadgets e.g. (Mobile Smart Shortcut Universal Dustproof Plug for Android Mobile Phone – a Pressy Clone). In conclusion, it is a basic activity tracker combined with a an app for tracking recording purpose. I like the fact that the build quality is decent, and it is IP67 certified. As with all China devices, at times build quality may be suspect, but so far, the Vidonn X5 looks pretty decent. It functions as a basic activity tracker, a basic sleep monitor, syncs and reports overall stats, OLED display for on the go monitoring, and functions as a simple watch, battery life of 4 days, and 1/3 the price of other fitness trackers at US$36. Did you do comparison of accuracy with other trackers? Does it work with phones without Bluetooth LE? as for bluetooth LE, no – an Android device must have both a BLE radio and software support in the operating system that allows third-party apps to use it. Android 4.3 and above is a must. 1. I got a booklet in English – I think Vidonn has improved quite a bit on the Android compatibility and English assistance since they started selling on Amazon (the reviews were dated Feb). 2. I wouldn’t say all Android devices, these low end devices tend to be finicky at times with compatibility. It works on a LG G Pro2 with stock Android 4.4, so yeah, as long as it is a mainstream device with Bluetooth 4.0/LE and at least Android 4.3+, you should be safe. Something to note: Under hot sun (was terribly hot yesterday in Singapore), it is impossible to read the OLED display – or at least extremely difficult. Looks like I wont get one because Xiaomi Mi band is coming soon and maybe be less than SIN $ 20 !!! How will other manufacturers survive ? Worse still….how about our Telcos and phone shops in 3 years time…..what will Xiaomi have on them ? Maybe its just going to be Xiaomi, Apple , Samsung and one or two other main brands here in Singapore. Yes! I am waiting for the Xiaomi one too – should be available in China end of the month but it is going to fly off the shelves!